By default, Netsparker ignores some URLs that do not need to be scanned, using a list of excluded file types or extensions, from scans. It is possible to modify this list of excluded file types from the Extensions tab when configuring a Scan Policy. By default, Netsparker does not crawl and analyze binary files during a scan. They are outside the scope of scanning a web application for vulnerabilities. In fact the Netsparker scanners have a built-in mechanism to check if HTTP responses are binary responses; if they are, they will be excluded from scans. If you have a number of binary files on your website, add their extension to this Extensions list, so that when the Netsparker scanners identify them they do not have to make the binary check. The advantage is that this shortens the scan duration. This table lists and describes the crawl options in Netsparker. Netsparker does not crawl file links and adds them to the Out of Scope with Extension Blacklisted reason. File links will be crawled. File links will be crawled if they have any Query String parameters. Otherwise they will be added to the Out of Scope with Extension Blacklisted reason. 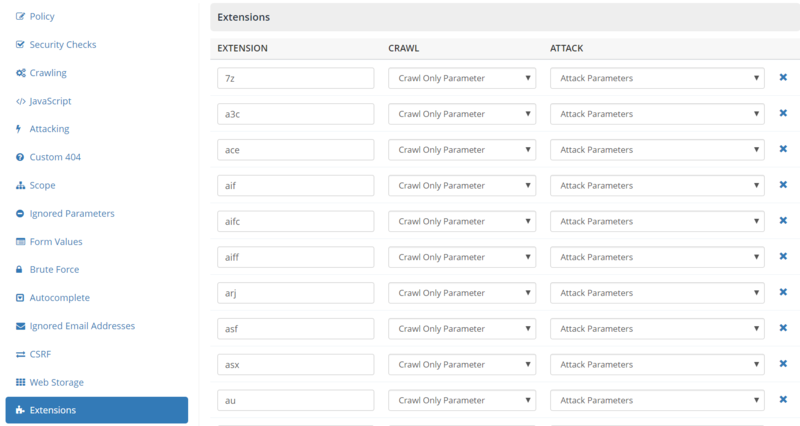 This table lists and explains the attack options in Netsparker. File links will be ignored. File links will be analyzed if they have a parameter. File links will be analyzed if they have a parameter or Query String. From the main menu, click Policies, then Scan Policies. In New Scan Policy window, click the Extensions tab. Select an existing item by clicking into its EXTENSION field. Click New to create a new, blank Extensions row. From the CRAWL dropdown, select an option (see Crawl and Attack Options). From the ATTACK dropdown, select an option (see Crawl and Attack Options). From the Home ribbon, click New. The Start a New Website or Web Service Scan dialog is displayed. From the Scan Policy section, click the ellipsis ( ) to open the Scan Policy Editor. From the left-hand menu, click Extensions. In the Crawl column, click into the cell and from the dropdown, select an option (see Crawl and Attack Options). In the Attack column, click into the cell and from the dropdown, select an option (see Crawl and Attack Options).